صالحی, محسن, نجاتی, حمیدرضا, گشتاسبی, کامران. (1396). بررسی تأثیر تنش‌های برجا بر رفتار مکانیکی تاندون‌ها در مغارهای زیرزمینی. نشریه انجمن زمین شناسی مهندسی ایران, 10(شماره 3 و 4), 11-28. محسن صالحی; حمیدرضا نجاتی; کامران گشتاسبی. "بررسی تأثیر تنش‌های برجا بر رفتار مکانیکی تاندون‌ها در مغارهای زیرزمینی". نشریه انجمن زمین شناسی مهندسی ایران, 10, شماره 3 و 4, 1396, 11-28. صالحی, محسن, نجاتی, حمیدرضا, گشتاسبی, کامران. (1396). 'بررسی تأثیر تنش‌های برجا بر رفتار مکانیکی تاندون‌ها در مغارهای زیرزمینی', نشریه انجمن زمین شناسی مهندسی ایران, 10(شماره 3 و 4), pp. 11-28. صالحی, محسن, نجاتی, حمیدرضا, گشتاسبی, کامران. بررسی تأثیر تنش‌های برجا بر رفتار مکانیکی تاندون‌ها در مغارهای زیرزمینی. نشریه انجمن زمین شناسی مهندسی ایران, 1396; 10(شماره 3 و 4): 11-28. امروزه ساخت سازه‌های بزرگ زیرزمینی نظیر مغارها افزایش یافته است. حفاری و ساخت مغار ها در اعماق زمین باعث می‌شود میدان تنش به طور موضعی به هم خورده و توزیع جدیدی از تنش ها در سنگ دربرگیرنده مغار به وجود آید و پایداری مغار را تحت تأثیر خود قرار دهد. برای پایداری مغار از سیستم­های مختلف نگهداری استفاده می‌شود که یکی از آن‌ها تاندون ها می‌باشند. تاندون ها تحت بار پیش تنیدگی قرار گرفته و عمل نگهداری را انجام می‌دهند. با توجه به قرار گرفتن مغارها در اعماق مختلف و نسبت تنش‌های متفاوت، اثر تاندون ها بر پایداری و کاهش جابه‌جایی‌های دیواره مغار متفاوت خواهد بود. در این تحقیق مغار نیروگاه سد راغون در تاجیکستان مورد بررسی قرار گرفته است که برای پایداری آن از سیستم نگهداری بتن برجا، داول و تاندون استفاده شده است. این مغار در عمق 400 متری از سطح زمین قرار دارد. برای بررسی اثر تنش‌های برجا بر رفتار مکانیکی تاندون ها، مغار مورد مطالعه با استفاده از نرم‌افزار Flac 2D شبیه سازی شده است. پس از بررسی پایداری مغار راغون و مقایسه نتایج آن با اطلاعات ثبت شده توسط ابزار دقیق، تأثیر تنش­های برجا بر رفتار مکانیکی تاندون­ها مورد ارزیابی قرار گرفته است. برای این منظور مغار مورد مطالعه در عمق‌های 100، 200، 300 و 400 متری و نسبت تنش‌های 5/0، 1 و 5/1 در مقابل مقدار بار پیش تنیدگی­های مختلف بر میزان جابه‌جایی و همگرایی دیواره مغار مورد بررسی قرار گرفت. مقایسه و بررسی نتایج حاصل از روش عددی نشان می‌دهد که با کاهش عمق، اثر تاندون­های تحت بار پیش تنیدگی بر کاهش جابه‌جایی دیواره مغار افزایش می‌یابد.همچنین با کاهش نسبت تنش، استفاده از تاندون­های تحت بار پیش تنیده موثرتر بوده و جابه­جایی دیواره مغار با نسبت بیشتری کاهش می­یابد. به عبارت دیگر افزایش نیروی پیش تنیدگی تاندون­ها در اعماق زیاد (بیش از 400 متر) تاثیر چندانی بر کنترل جابه­جایی محیط اطراف مغار ندارد و توصیه می شود در چنین شرایطی تاندون ها با کمترین مقدار پیش­تنیدگی نسب شوند. Large underground caverns are used for a variety of purposes in rock engineering. These include caverns housing turbines, electrical generators and transformers in hydroelectric projects, caverns for storing liquid or gaseous fuels, underground warehouses and underground sports facilities. Rock-anchoring tendons is one of the most effective supporting system to control rock mass failure in underground excavations. However, in the deep underground excavations failure of the tendons has been frequently reported. The purpose of this study is evaluation of the effect of in-situ stress on the mechanical behavior of rock anchoring tendons. For this aim, Raghun underground power cavern located in Tajikistan's Dushanbe was studied as case study. An accurate 2D model is prepared by FLAC 2D V. 7.0 and the sidewall convergence of cavern is compared with the monitoring data recorded from 1989 to 2015. In the next, effect of in-situ stress on the mechanical behavior of tendons in cavern’s wall is considered and it is found that with increasing the cavern depth, the effect of pre-stress on the reduction of wall deformation decreases. ASTM A416., 2015. Standard Specification for Low-Relaxation, Seven-Wire Steel Strand for Prestressed Concrete. Barla, G., 2013. Techno-Economic assessment study for rogun hydroelectric construction project. Barla, G., 2014. Underground powerhouse stability in sandstone and siltstone formations. 15th Series – Rock Mechanics and Rock Engineering Conferences. Torino. Boon, C. W., Houlsby, G. T., Utili, S., 2015. Designing tunnel support in jointed rock masses via the DEM. Rock Mechanics and Rock Engineering, 48(2): 603-632. Brown, E.T., Hoek, E., 1978. Trends in relationships between measured rock in situ stresses and depth. Int. J. Rock Mech. Min. Sci. & Geomech. Abstr.15, pp.211-215. Gao, F. Q., & Kang, H. P., 2008. Effect of pre-tensioned rock bolts on stress redistribution around a roadway—insight from numerical modeling. Journal of China University of Mining and Technology, 18(4): 509-515. Hoek, E., Kaiser, P. K., Bawden, W. F., 2000. Support of underground excavations in hard rock. Itasca Consulting Group, Inc., 2011. FLAC Version 7.0 User’s Manual, Minneapolis. Kim, N. K., Park, J. S., Kim, S. K., 2007. Numerical simulation of ground anchors. Computers and Geotechnics, 34(6): 498-507. Koca, M. Y., Kincal, C., Arslan, A. T., Yilmaz, H. R., 2011. Anchor application in Karatepe andesite rock slope, Izmir—Türkiye. International Journal of Rock Mechanics and Mining Sciences, 48(2): 245-258. Li, C. C., 2012. Performance of D-bolts under static loading. Rock Mechanics and Rock Engineering, 45(2): 183-192. Maejima, T., Morioka, H., Mori, T., & Aoki, K., 2003. Evaluation of loosened zones on excavation of a large underground rock cavern and application of observational construction techniques. Tunnelling and underground space technology, 18(2):223-232. Nicholson, G. A., 1994. Book review-Comprehensive Rock Engineering, Principles, Practice & Projects. by JA Hudson (Editor-in-chief) and ET Brown, C. Fairhurst and E. Hoek (senior editors), Vols. 1 to 5, 1983. Pergamon Press, Oxford, UK, ISBN 0-08-042066. Engineering Geology, 37(3-4): 311-313. Pelizza, S., Oreste, P. P., Peila, D., & Oggeri, C., 2000. Stability analysis of a large cavern in Italy for quarrying exploitation of a pink marble. Tunnelling and underground space technology, 15(4): 421-435. Sabatini, P. J., Pass, D. G., Bachus, R. C., 1999. 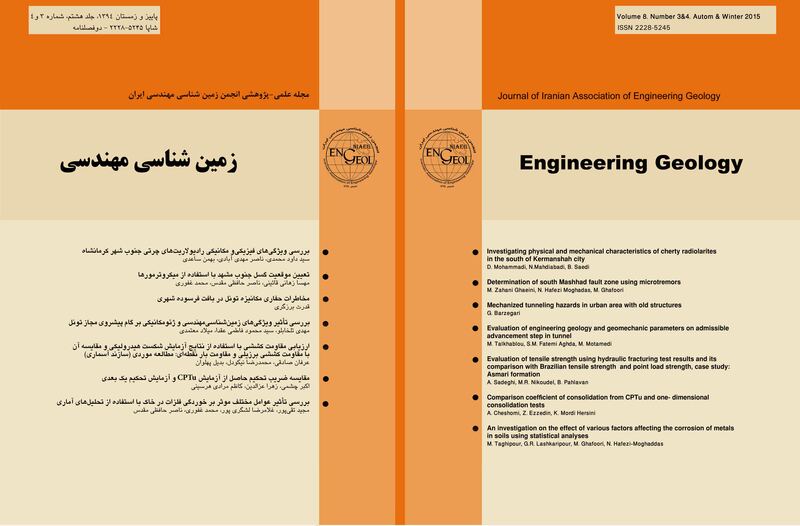 Geotechnical engineering circular no. 4: Ground anchors and anchored systems (No. FHWA-IF-99-015). Tezuka, M., & Seoka, T., 2003. Latest technology of underground rock cavern excavation in Japan. Tunnelling and Underground Space Technology, 18(2): 127-144.